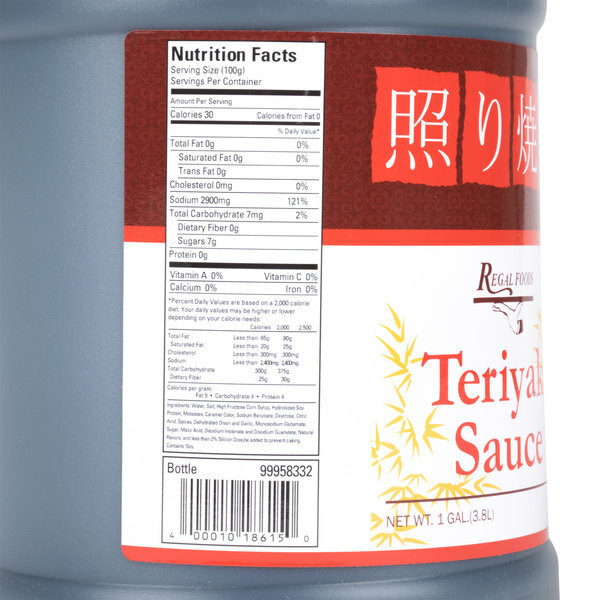 Add a spicy twist to your most popular dishes with this Regal Foods 1 gallon teriyaki sauce. Buying condiments, sauces, and baking ingredients in bulk is an excellent way to save money without sacrificing taste and value. This Regal Foods teriyaki sauce is no exception with its great taste and versatile use! 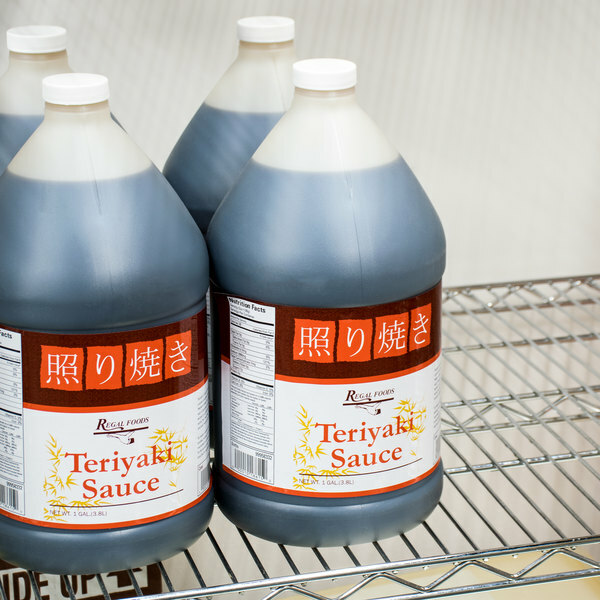 Great for restaurants, bistros, and steakhouses, this teriyaki sauce is sure to become a staple in your kitchen or pantry. "The Regal brand is always a great value for the money. This teriyaki sauce works well with our receipes and the price is unbeatable too." Featuring a rich color and a light consistency, this teriyaki sauce brings a savory yet sweet taste to any dish without sacrificing distinctive, quality flavor. An economical option for any kitchen, this pre-made sauce makes it easy to add the crowd-pleasing taste of teriyaki to your menu! Teriyaki sauce is often used in Asian dishes as a marinade for meats, poultry, and fish that are later fried, broiled, or grilled. this full-bodied teriyaki sauce is great for everything from traditional teriyaki chicken to barbecued ribs seasoned with a kick of teriyaki flavor. Use it in vegetable stir fry, or use it as a flavorful marinade, glaze, or sauce base for meats. This teriyaki sauce was a nice starting base for stir fry. I like to heat this on the stove on low with some honey, garlic, pepper, and ginger. It is delicious! Regal foods teriyaki sauce is delicious and makes a great seasoning for our chicken and vegetables. The gallon size jug is a great price and last us a few months. It stores really well. A nice quality teriyaki sauce that is excellent for marinating chicken and pork. A great way to make our teriyaki chicken kabobs. A nice Asian sauce. A nice quality Teriyaki sauce that is great for seasoning chicken and steak. I love the tangy flavor and the sauce really coasts the meat well. A great bulk buy. 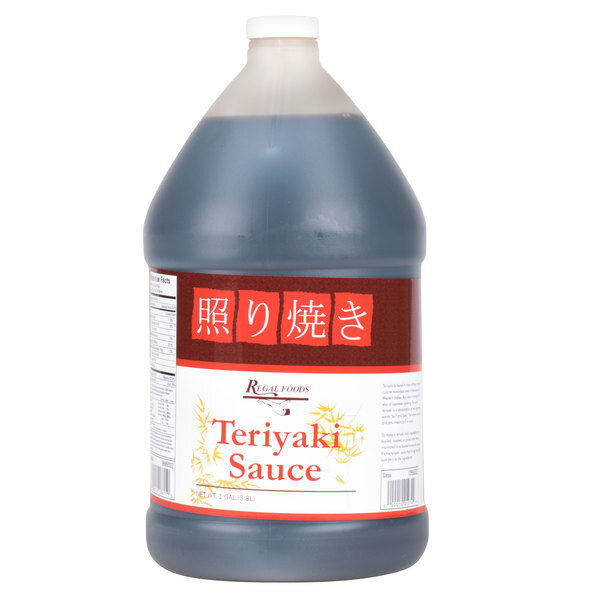 A great quality teriyaki sauce at such a great price! I love having this product to cook with, and it is definitely something I will purchase again in the future! A great Teriyaki sauce with a superb sweet and savory flavor. Makes for excellent Teriyaki shrimp and really adds a nice zing to our Asian slaw. We use this for our chicken wings and texture is nice and soft. Taste is great and love it cuz the sauce is soft, this prevent the chicken from been sticky. A great quality teriyaki that tastes great and is the perfect price point. A great sauce that really makes a great tasting teriyaki chicken and steak. 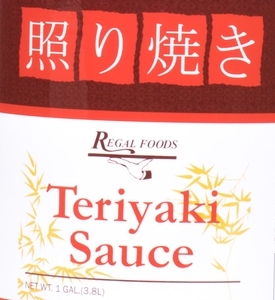 Excellent quality teryaki sauce from Regal price is amazing and the flavor is delicious I use it in many of my marinades and Asian dishes. This Teriyaki Sauce has an excellent flavor. Regal Foods once again provides a product that we cannot complain about. This is definitely an A+ product! This is a good quality sauce, well worth it for the price. However, as a heads up, this is the kind of teriyaki sauce you will get in the bottle by the soy sauce - it's not a thick sauce. Didn't realize it was that salty. So now I now how much to use on my meat and other things, but it is good thank you. A good product but kind of heavy on the salt side, so we had to thin it out a bit but will buy again with no hesitation. The Regal brand is always a great value for the money. This teriyaki sauce works well with our receipes and the price is unbeatable too. Incredible value. A great sauce for use in asian cooking, wing sauces, dipping sauces, etc. Get a gallon for what other places charge for a liter! Excellent product, great taste, flavoring is perfect and the case quantity makes it a smart economical buy for myself. Despite the bulk, shipping was extremely reasonable.